Indulge yourself. You deserve this! At Las Vegas Dermatology we have a full range of aesthetic tools available to improve and beautify your skin in order to help you achieve a healthier & more beautiful life. 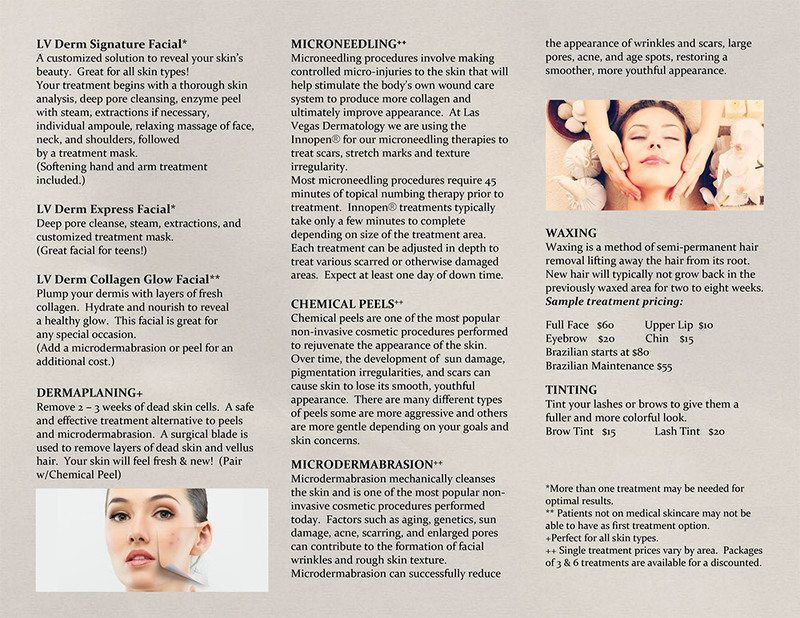 Our holistic skin care approach will give you a defined action plan with expected results. Your consultation begins with a Visia image to provide a baseline evaluation of your current skin situation. One of our skin care professionals will assist in helping you choose from: outstanding skin care products, makeup, Chemical Peels, Botox®, Dysport®, Xeomin®, Juvederm®, Restylane®, Microneedling, Laser, and Waxing. Once we better understand your skin we will set goals and will work with you to choose tools to improve your appearance. Our advanced laser services include laser therapies for unwanted: wrinkles, spider veins, redness, small blood vessels, hyperpigmentation, melasma, tattoos, ink, and excess hair growth. Most laser services require multiple treatments, and our experienced laser team will plan out your specific care regimen. Improve your appearance by evening out the color, texture and smoothness of your skin by removing redness, wrinkles, scars and excess body hair in treated areas. Multiple different skin care products and services are available at Las Vegas Dermatology, and it is important to work as a team to help your skin look its best. Some conditions may require more time, cost, downtime and patience to resolve or improve than other more easy to treat conditions. Our Las Vegas Dermatology team will be happy to help you make the correct cosmetic skin care decisions whether it is a product, provided service, or if you should seek care elsewhere. Spa services are considered cosmetic in nature and are not medical or covered by insurance. If your visit is of a medical nature, you will need to see a physician and standard medical charges may apply. Most medical visits to a dermatologist are covered by insurance plans, however prospective patients are advised to call their insurance provider prior to making an appointment. Knowing your goals and budget will allow us to choose the tools and treatments necessary for a healthier and more beautiful life. Call us now to learn more at (702) 456-3120 or click here.